I recently shared with you some of my journey regarding headcoverings for women. La Soñador ~: Spiritual and Physical Headcoverings? Since then I have worn my headcovering periodically. Most especially for the Sabbaths, special occasions, and sometimes when going to town. Coming from generations of women who did not wear headcoverings has made this a longer journey. How does one coif their hair properly, what colors would be acceptable for a wife and mother of my age and stature, How do you keep it on your head while going about your duties? It is quite a learning curve for me. I came across this excellent teaching that challenged me further. I realized that much of my reasoning, was in fact a form of arguing and rationalizing why I did not need to follow the words written. "I am equal to any man in the eyes of God." "I can go to God directly anytime I want to." "I will be accepted by God no matter what." I realized that my thinking did not just toss aside the man's headship over me, but also the Messiah's headship, as I strode headlong to the throne, ignoring this simple request. It raises such questions!! Is the woman's long hair a covering or is it made FOR a covering to go over it?" If a woman is to cover, how much should she cover, what should she cover with, and where and when should it be covered? Is it a HARDSHIP for me to cover my head while praying and prophesying? First.... The scriptures tell us to "Pray continually." And.... well.... actually I do. I pray all day long. I walk down the hall and say a little prayer. I sort the laundry and say a little prayer. I tromp outside to check the gardens or the animals and say a little prayer. I pray about what to make for dinner. I pray how to fix things that go wrong or get broken or people and animals that get sick or injured. I pray while I wash the dishes. I pray all the time. I even pray in my dreams, all the time. Sooooooo to cover my head while I am praying and prophesying.... it means I will have to cover all the time. Now a couple times in my day, these may be a hardship. When I am showering... and when I am sleeping. But the rest of the time..... Not a hardship. Pretty easy to do. And... well.... since I am actually figuring out these scarves, I find they are quite comfortable. It keeps all my hot, hot hair off my neck and back on hot days. It keeps all my itchy, crazy hair out of my face, which I can't stand. Here is a blog that shows many wonderful ways of tying your scarves to make your headcovering comfortable and beautiful. She includes many tutorial videos and photos. I love the variety of color. And here is a company that sells some beautiful headcoverings, and other modest clothing as well. They use a volumizer under their headcoverings.... I can see that it makes a big difference in the shape of the covering and, to me, makes it quite attractive. While that would not be practical for daily use, perhaps for special occasions. I also love how they mix and match colors, patterns and fabrics to make such delightful coverings. Again.... this is going on my sewing to do list! I recently made my family tassels for our clothing. You may well wonder, "WHY????" Surprisingly, this is one of the biblical laws that many are unaware of. The hebrew word used in scripture is Tzitzit (pronounced tzee-tzeet). There is much discussion about how they should be made, tied, worn and by whom. From the scriptures we can see that 'the children of Israel' (by the by, if you are grafted in, that includes you) are to make tassels to hang from four corners of your clothing, with a blue thread in them. They are a physical reminder to you to remember all the commandments of YHWH and do them. Obviously, like other commandments, this physical sign does not mean ANYTHING, unless your heart is in alignment spiritually. If you reject the commandments of YHWH and/or choose not to DO them, then wearing some tassels on your clothing would be meaningless. BUT, like these other commandments, this physical sign is SYMBOLIC of spiritual state that YHWH desires in us. He desires us to REMEMBER HIM and His commandments. He desires us to LOVE Him and to show that love by following His commandments. He desires our obedience that will enable Him to pour out His blessings upon us. Just SEE how intertwined LOVE and His Commandments are. I really had alot of fun making these for the family. I made a plain blue set for my husband and oldest son. And then I made multi colored ones for myself and the children, using our favorite colors, but carefully remembering to include at least one blue thread in each. After this I made a second pair for each child with some beads because... well... because I could. I used plain embroidery thread of various colors. The beaded ones are simply knotted around the beads. The ones without beads I chose to use the aleph-bet to guide my knots. I began with three knots for the Father, the Son and the Holy Spirit, then ten braids, three knots, five braids, three knots six braids, three knots, five braids and three knots. The ten, five, six, and five are for Yod Heh Vav Heh, YHWH. Of course, that is just what I did. You can do it however you like! Following the Law of YHWH is not burdensome and comes with so much freedom and joy. While I think that sometimes traditions can teach us some things, I believe that we must be careful that we are not neglecting or rejecting the law of YHWH for tradition. For example, the Talmud (jewish rabbi's teaching and traditions) teach that the blue thread of the tzitzit must be dyed with a particular dye. However that dye is extremely expensive. So now, MANY people wear only white tzitzits, trying to follow the law of YHWH, but putting TRADITION over the actual scriptural LAW. After explaining WHY we make and wear these tzitzits, the children were very proud to wear them. For their little bodies, active bouncing whirlwinds that they are, I have found a simple belt with the tzitzits looped on it works best. I tried safety pins and they were all misplaced within an hour. With the belts we haven't lost one. For myself, safety pins worked fine until I went on a hike in the trees and underbrush. Here, someone is selling tzitzits quite affordably. Please note that these do not all contain a blue thread, which is one of the ACTUAL requirements by scripture. But if you were unable to make your own, this would be a great way to start following this commandment with ease. And here you can purchase ready made belts with tzitzits attached. I really thought these were inventive and cute! They have plain and darker colors for men as well. But for the children..... and for myself..... I could definitely see myself wearing these. Next time I pull out my sewing machine this is on my to do list! FIRST baby to survive Potter's Syndrome! I am praising! I have friends that personally know Jamie Herrera Beutler and spread the word mere months ago that prayers were requested for her baby. The diagnosis seemed like a death sentence. As Wikipedia reports Potter's Syndrome "has proved to be lethal in all cases of singleton births," and "are, or are near, lethal in 100% of the cases." What a precious and amazing blessing. Beautiful and exactly my heart's cry to my fellow Christian believers. I know the sincerity of your love. I know your heart for Christ. I am FURIOUS at the lies we have all been told. I wish they were shattered in a million pieces so that we could all worship in Spirit and Truth! "The righteous shall flourish like the palm tree: he shall grow like a cedar in Lebanon. Those that be planted in the house of YHWH shall flourish in the courts of Elohim. To shew that the YHWH is upright: He is my rock, and there is no unrighteousness in him." Here is another version of the same production where they covered EVERYTHING in the book of Luke. “And now, Israel, what does YHWH your Elohim require of you, but to fear YHWH your Elohim, to walk in all His ways and to love Him, to serve YHWH your Elohim with all your heart and with all your soul, 13 and to keep the commandments of YHWH and His statutes which I command you today for your good?" "When will YOU decide to become disciples?" Update 7/26/2013 - This story is not factual. I still feel that it has an important principle to teach. As such, I will not be removing it. Consider though, if a preacher today really did have the spirit and guts to tell it like it is and cut to the dividing of soul and spirit by the word of Yah..... what a thing to imagine. Pastor Jeremiah Steepek (pictured) transformed himself into a homeless person and went to the 10,000 member church that he was to be introduced as the head pastor at that morning. He walked around his soon to be church for 30 minutes while it was filling with people for service....only 3 people out of the 7-10,000 people said hello to him. He asked people for change to buy food....NO ONE in the church gave him change. He went into the sanctuary to sit down in the front of the church and was asked by the ushers if he would please sit n the back. He greeted people to be greeted back with stares and dirty looks, with people looking down on him and judging him. After he recited this, he looked towards the congregation and told them all what he had experienced that morning...many began to cry and many heads were bowed in shame.... he then said....Today I see a gathering of people......not a church of Jesus Christ. The world has enough people, but not enough disciples...when will YOU decide to become disciples? He then dismissed service until next week.......Being a Christian is more than something you claim. I'ts something you live by and share with others. While most are 'anxiously' watching the birth of the royal baby REAL NEWS was happening. Abu Ghraib attacked by suicide bombers, mortars, and rocket propelled grenades and freed more than 500 prisoners, most of whom were sentenced to death. Simultaneous prison attack in a nearby region failed to free prisoners. Check it out yourself. It looks .... amazing. They keep updating it so that the trailer remains available. to be loving, giving, a blessing and to focus on the needs of others before self. Paying for votes with sugar and oil..... oh my heart goes out to these people, just trying to survive. Do you ever wonder why the hare often escapes the fox? It is because the fox is running for his dinner - the hare is running for his life. This is the day where many remember and mourn many events in history which occurred on this Hebraic Calendar date. The spies returned from Canaan reporting that they had no chance of taking the promised land. YHWH did not allow them to enter the promised land for another 40 years. The first temple was under siege from Babylon and the fire began that destroyed it, 587 BC. The second temple was under siege from Rome and destroyed, 70. Romans destroyed the last Jewish stronghold Betar, 132. Romans plowed the temple area, 133. The First Crusade commenced, 1096. Jews were expelled from England, 1290. Jews were expelled from France, 1306. Jews were expelled from Spain 1492. World War I began 1914. The German "Final Solution" was approved, 1941. Warsaw Ghetto was deported to Treblinka, 1942. FFOZ - The Ninth of Av: "Blessed Are Those Who Mourn"
La Soñador ~: Mother Teresa, "The Best Way To End Abortion..."
La Soñador ~: Moment of Silence"
I realize that most pastors are not saying a word of warning to their congregations, but, folks, things CANNOT continue as they are for a whole lot longer. We are probably no more than 8-10 years away from a nuclear war with China and Russia; the American police state is growing so rapidly the fundamental freedoms of this republic will probably not survive another handful of years; the manipulated and fabricated debt-driven economy cannot stay afloat for too many more years; unchecked and encouraged illegal immigration is a time bomb; any serious disaster will mean certain food and gas shortages and mass lawlessness. During any major disaster, there are no more than 3 or 4 HOURS worth of food in the grocery stores. Same with gasoline. At the risk of sounding alarmist notwithstanding, ask yourself, if any of the above happened now, are you where you want to be? Because, when it happens, you will NOT be able to relocate, and that is an absolute fact! During such an event, living in or near any major metropolitan area would be a disaster. In the event of a nuclear attack, living downwind of a major military installation would be a disaster. To not be prepared for such an event would be a disaster. I'm only asking you to prayerfully and sincerely begin pondering these things NOW, because when it happens, it will be too late. For people who say, "This is America--it can't happen here," let me ask you, would you have believed just a few years ago that what has happened here would happen? But it HAS happened here, hasn't it? God is relocating His people in a way that we have not seen since the Pilgrims migrated from Europe to America. This is no coincidence. All I will say is if the still, small voice of God is tugging at your heart about this, you need to pay attention. La Soñador ~: Is The Rapture Biblical? "Very great mistakes have been made..."
"Very great mistakes have been made about the law. Not long ago there were those about us who affirmed that the law is utterly abrogated and abolished, and they openly taught that believers were not bound to make the moral law the rule of their lives. What would have been sin in other men they counted to be no sin in themselves. From such Antinomianism as that may God deliver us. We are not under the law as the method of salvation, but we delight to see the law in the hand of Christ, and desire to obey the Lord in all things. Others have been met with who have taught that Jesus mitigated and softened down the law, and they have in effect said that the perfect law of God was too hard for imperfect beings, and therefore God has given us a milder and easier rule. These tread dangerously upon the verge of terrible error, although we believe that they are little aware of it. Alas, we have met with authors who have gone much further than this, and have railed at the law. Oh, the hard words that I have sometimes read against the holy law of God! How very unlike to those which the apostle used when he said, “The law is holy, and the commandment holy, and just, and good.” How different from the reverent spirit which made him say, “I delight in the law of God after the inward man.” You know how David loved the law of God, and sang its praises all through the longest of the Psalms. The heart of every real Christian is most reverent towards the law of the Lord. It is perfect, nay, it is perfection itself. We believe that we shall never have reached perfection till we are perfectly conformed to it. A sanctification which stops short of perfect conformity to the law cannot truthfully be called perfect sanctification, for every want of exact conformity to the perfect law is sin. May the Spirit of God help us while, in imitation of our Lord Jesus, we endeavor to magnify the law." The earth was unformed and void, darkness was on the face of the deep, and the Spirit of God hovered over the surface of the water. 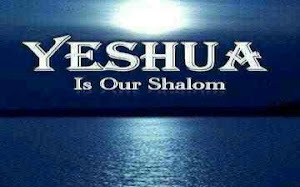 Yeshua referred to Himself as the living water; when received, we will never thirst. "For my people have committed two evils: they have abandoned me, the fountain of living water, and dug themselves cisterns, broken cisterns, that can hold no water! Hope of Isra'el, ADONAI! All who abandon you will be ashamed, those who leave you will be inscribed in the dust, because they have abandoned ADONAI, the source of living water. Whoever puts his trust in me, as the Scripture says, rivers of living water will flow from his inmost being!" "For the Lamb at the center of the throne will shepherd them, will lead them to springs of living water, and God will wipe every tear from their eyes." And he said to me, "It is done! I am the 'A' (Alef) and the 'Z,' (Tav)' the Beginning and the End. To anyone who is thirsty I myself will give water free of charge from the Fountain of Life. The Spirit and the Bride say, 'Come!' Let anyone who hears say, 'Come!' And let anyone who is thirsty come - let anyone who wishes, take the water of life free of charge." Now look at the physical properties of water. Hydrogen and Oxygen, in liquid form, are so cold to the touch that they would cold burn anything that touches it ... but when combining 2 parts Hydrogen with 1 part Oxygen it becomes water. To combine Hydrogen and Oxygen, in this way, should be a physical impossibility, but yet it is ... it is a miracle. Then again ... water was never created. ... water is life and always has been. "He learned that when plowing with animals, they tend to plow where you look. If your attention is drawn to the left, you unconsciously direct your mules or horses to the left. If your attention is drawn to the right, you plow to the right." A friend of mine shared this excellent video regarding Functional Illiteracy. I have known many who suffer with it, and many who have overcome it as she did. I once tutored a little girl in a local elementary school, while I was in High School. She was having difficulties in her reading and falling further and further behind her classmates. They discussed holding her back. She began coming to my home several days a week after school. I didn't go over phonics with her. We didn't do sight words, or sentence structure. I didn't make her write grammatical sentences and work on spelling. Those techniques all have their place. But they do not INSTILL THE JOY of reading. It is like a cooking class that only teaches how to make white rice, in MINUTE detail. :) Everyone wants to MAKE A CAKE! I read to her. I read and read and read to her. I went through my books and found the most fanciful and outrageous. Books with beauty and imagination. All I did was read. And she learned to WANT to read. After a couple of months she was EXCELLING in school and reading above her grade level. I love to read. My earliest memories are built upon reading. My mother teaching me my letters. She taught me how to read before I entered kindergarten. From the age of 7 I would have my face in a book for the majority of my freetime. I remember those short beloved chapter books, The Trumpet of the Swan , Stuart Little , Sign of the Beaver , Laura Ingalls Wilder , Anne of Green Gables . Mr. Popper's Penguins was so much fun. I read and read and read. Fortunately my grandmother was a reader too and was MORE than happy to keep me in books. I loved our trips to the bookstore, which is STILL one of my very most favorite places to go (haven't been in.... lol over 6 years) (hint for hubby.... 'my dream date night'). Then there was the Chronicles of Narnia , The Hobbit , The Lord of the Rings . My heart really leaned towards the fantastic, and amazing and impossible. Dragons, elves and fairies, space ships and other worlds. The Death Gate Cycle , Thomas Covenant , Memory, Sorrow and Thorn , Sevenwaters , The Samaria Series . Worlds of fancy and delight. One of the best gifts I ever received was from my husband who had tracked down every single book written by David Eddings and gave me a PILE of wonderful to delve into. I also enjoy reading for my edification. I read the books and articles on self sufficiency, gardening, herbal remedy making, animal raising and homeschooling. Michael Bunker , Carla Emery , John Seymour . I also read the Word of YHWH throughout the day and follow that with various commentaries and historical researchers to help my understanding of its mysteries. Matthew Henry, Lex Meyer, Dan Israel, 119 Ministries, Greek and Hebrew Interlinears. I tell my children often... if you can read for yourself, you can learn ANYTHING. You can pick up any subject you want and learn it. If you learn to read you won't need other people to interpret things for you, and you won't have to depend (and hope and pray) that others are not misleading you. You will be able to learn it for yourself. 2 Timothy 2:15 says, "Give diligence to present yourself approved by God, a workman who doesn't need to be ashamed, properly handling the Word of Truth." Being able to read it for yourself..... is a blessing beyond measure. "In the early formative years of this country, men, women and children came here having to deal with the elements of a strange land, long hard voyages, hunger, etc. They faced difficulties upon difficulties for one primary purpose, to seek religious freedom. This country was founded on the principles of liberty and freedom of conscience as expounded upon in the Scriptures. From this foundation emerged a government that was uniquely different, based in Scriptural common law and comprised of men who upheld it. Many came from Europe and England where the churches had a strangle hold on the minds of men and freedom of thought and expression was not politically correct or acceptable in the face of the State controlled church. It was controlled then much as it is today. The yearning desire to live and worship freely was a strong drive that took many away from the comforts of their homeland, in hope and in faith, to places unknown. This was the driving motivation and desire of many of our forefathers, the Christian Israelites who settled this land. Today, in this country, uniquely and prophetically, descendants of all twelve tribes of Israel have assembled. As the truth unfolds, and as prophesied, they are beginning to understand who they are, their heritage and their responsibilities." "Ten years before the Civil War, the city of Rochester, N.Y., asked Frederick Douglass to speak for its July 4, 1852, celebration. He accepted, but rather than join in the "celebration," Douglass took it in an unexpected direction. Here, Danny Glover performs a brilliant retelling of that speech." Jesus said to her, "Neither do I condemn you: go, and sin no more." Whose Doctrine Are You Following?